Craig Hendrick, a teacher at Perry Meridian 6th Grade Academy and a member of Perry Meridian Education Association, was a 2018 NEA Foundation Global Learning Fellow. He was one of 45 educators in the nation to participate in the program this past year. As a global fellow, Hendrick spent the year building global competency skills. This summer Hendrick travelled to South Africa for the culmination of the program. Here’s more about his experience in his own words. Eating foods that you’re not quite sure what they are. Navigating unfamiliar streets hoping to find the hidden restaurant that locals have told you about. Singing the song of South Africa on a bus full of teachers. All of these, and more, happened thanks to the NEA Foundation Global Learning Fellowship, which I participated in last school year. 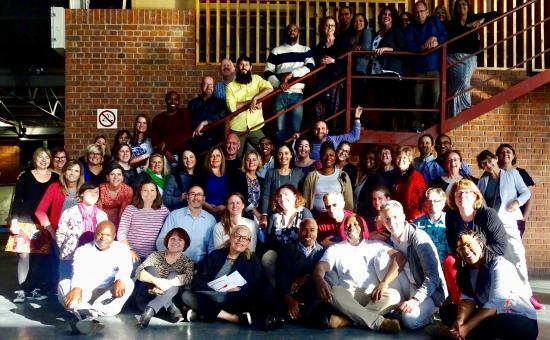 The year-long professional development in global education culminated in a two-week field study in South Africa. Global education focuses on key components such as encouraging teachers and students to investigate the world, recognize different perspectives, share and communicate ideas and take action on learning. I joined 45 other teachers from around the U.S. on a 17-hour plane ride to Cape Town, South Africa. There is really nothing like going on an educational journey with educators. Though we had participated online through seminars and projects for most of the school year, meeting one another in-person was energizing. While in South Africa we had the chance to visit several schools and educational programs. On one visit, I had a fifth-grade student as a tour guide. He shared with me the wonderful programs and opportunities his school offered. It was amazing to see students hoping to better themselves and their community. Their perspective and outlook was inspiring. We heard from Antoinette Sithole about her brother Hector Pieterson. They were unexpectedly important figures in the apartheid movement when Hector was shot. The moment was captured on camera, and Antoinette has been sharing their story ever since. The network of colleagues I’ve connected with thanks to the NEA Foundation is empowering. I am a better teacher thanks to the sharing of ideas and strategies. Both in the classroom and as a person, the fellowship has made me a stronger teacher. My classroom is different and better thanks to the global education component included in my classroom. Students are getting more chances to solve real problems thanks to my experiences online and overseas. My students are global. I have many different countries and languages represented in my classes. My community is global, and we are learning to make it better every day. Now, my curriculum reflects my students and community. For more information and to apply for an NEA Foundation fellowship or grant, visit neafoundation.org.